Visit us on Facebook – and become a fan! We are practically giving it away, as we do every summer. It’s our Live at the Met Summer Encore Series, featuring the recently-ended season’s most popular shows – each for only $15. Not only a wonderful chance to re-enjoy many of the productions you saw at full price, this is also a great way to introduce tentative friends to the rich and fascinating world of opera. Saturdays at 10am. Get your espresso drink at concessions, and watch in cool comfort. 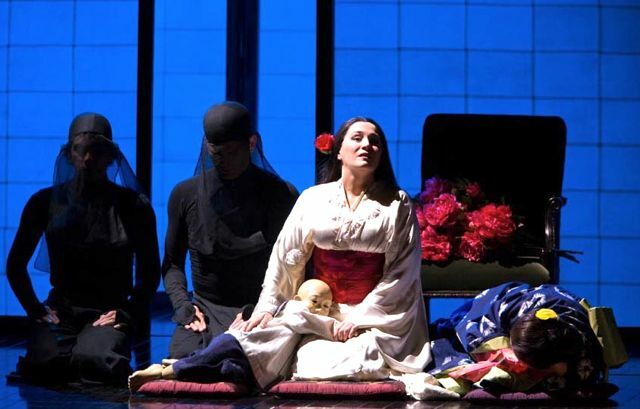 Anna Netrebko opened the Met’s 2011-12 season with her portrayal of the ill-fated queen driven insane by her unfaithful king, singing one of opera’s greatest mad scenes. Marco Armiliato conducts. Bel canto sensation Juan Diego Flórez sings the title role of this vocally dazzling comedy, in Bartlett Sher’s Met premiere production. Mariusz Kwiecien is the world’s most famous lover in Michael Grandage’s elegant new production, led by Met Principal Conductor Fabio Luisi. Joseph Calleja stars in the tour-de-force title role of this fictionalized take on the life and loves of the German Romantic writer E.T.A. Hoffmann. Met Music Director James Levine conducts. Strauss’s comic masterpiece of love and intrigue, starring Renée Fleming. Edo de Waart conducts. Live On Stage at the Lark! It’s a mad mad mad mad post-modern world here at the Lark, where “Live” can mean different things. Often it refers to opera singers in NYC, or actors in London or on Broadway, who are performing simultaneously on their respective stages and on our screen. Sometimes, though – like when our (truly wonderful) On Stage at the Lark series is in swing – we proudly present actual performing humans, in the flesh. 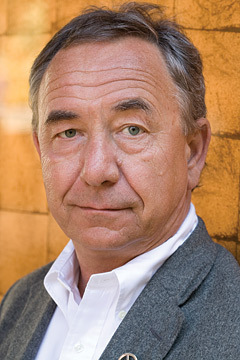 Producer Ellie Mednick is bringing great stuff to our stage in the coming weeks, starting with the brilliant Will Durst. In an election year, this is the guy to see. The New York Times calls him “possibly the best political comic in the country.” Author, syndicated columnist, radio and TV commentator, stage and screen actor, radio talk show host, nominated for 6 Emmy Awards. Sample his down-to-earth outrageousness here. 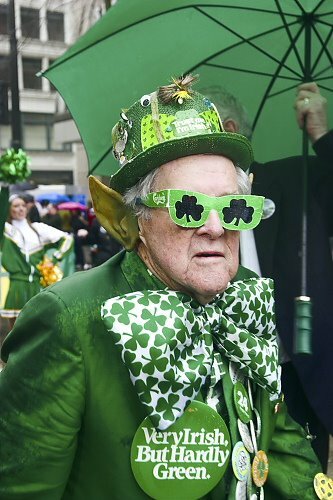 We do NOT want this gentleman to show up and find us with nothing going on for St. Patricks Day. That wouldn't be good. Next up is St. Patrick’s Day, and of course we are celebrating. On March 16 we have a great evening planned, starting with the documentary JIG. This is the first time the controlling body of competitive Irish dance has ever allowed an outsider to film this fiercely competitive world, and director Sue Bourne discovers an amazingly diverse range of characters, competing in the 40th Irish Dancing World Championships – a hot bed of dedication, hard work, obsession and passion. Even the trailer is fascinating. View it here. Following at 8pm are the fabulous Black Brothers, bringing Old Dublin street and music hall songs and historical ballads from the Irish, English and Scottish traditions along with songs from contemporary writers. Check them out here. Come for the music, the movie or both. The Oscars are just around the corner and we will be celebrating in our usual high/medium/low/mix-it-up style. Join us for our 8th Annual Awards Night Party! It’s the Oscars broadcast live on Feb. 26, with costume contest, auction and prizes. A delicious dinner from our great local restaurants, appetizers, desert and wine are all included in the ticket price. This year’s costume contest brings a wealth of opportunity. Steampunks have HUGO. Those who favor casual yet chic clothing made from expensive fabric that drapes nicely can come as the modern-day characters from MIDNIGHT IN PARIS. Marilyn Monroe (MY WEEK WITH MARILYN) and Margaret Thatcher (THE IRON LADY) are both options; or just wear your usual Izod shirt, wind-breaker and baseball cap (MONEYBALL). Something for everyone. Tickets are $55 General ($45 for Lark Theater members), $75 VIP. They are going quickly, so we recommend you call in advance: 415.924.5111. Details on our website. You will fall in love with writer Sholem Aleichem and primatologist Jane Goodall, if you haven’t already. The way you did with Bill Cunningham if you saw that movie here this past spring. They are true originals: light-hearted, deep-souled and brilliantly perceptive documenters of… well, we’re all primates, so let’s just be inclusive and say primate nature. You might not fall in love with John Huston. Or if you do, you might be sorry. Lauren Bacall, who knew the type, described him as ”daring, unpredictable, maddening, mystifying and probably the most charming man on earth.” Trouble. Also an unsparing deconstructor of the brutality and opportunism that a hostile environment can breed. Here, as among the chimps, it’s survival of the fittest. But while Goodall’s vision of human evolution has compassion at it’s center, Huston’s survivors are shrewd, unflinching, cool. Meet Sam Spade. 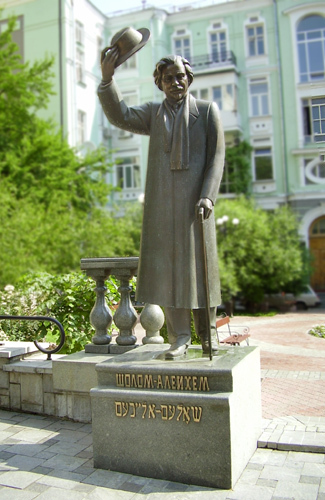 A monument that captures Sholem Aleichem's style and wit, both brimming in his writing. He is also remembered in streets and schools that bear his name in Russia, Argentina, Australia and Israel. And an impact crater on the planet Mercury bears his name. For real. A monument that captures Sholem Aleichem’s style and wit, both brimming in his writing. He is also remembered in streets and schools that bear his name in Russia, Argentina, Australia and Israel. An impact crater on the planet Mercury also bears his name. For real. JANE’S JOURNEY opens 9/30. Jane Goodall needs no introduction. 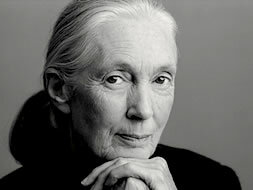 Her work in animal research and conservation is legendary. An inspiring portrait of the person behind the icon, this documentary features spectacular footage from her private collection. Here she is in a TED Talk, worth watching for her chimpanzee call alone. On Monday 10/3 we’ll show THE MALTESE FALCON, John Huston’s instantly iconic directorial debut, considered by many to be the first Film Noir. 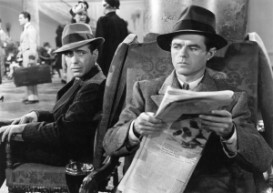 Humphrey Bogart plays Sam Spade. Muscular, stylish, daring – forever a cinematic thrill. Jeffrey Meyers, author of the new Huston biography “Courage and Art,” joins us to introduce the film. Sunday’s Women’s World Cup soccer Final between USA and Japan is going to be amazing, thrilling, historic. What do you need to know to be fully swept up in the excitement? A little background never hurts. Let’s start with the home team. USA has long been a superpower in women’s soccer. They broke onto the world stage in 1999, when 90,000 people filled the Rose Bowl to watch USA play China in the final. The score was tied 0-0 at full time and remained so until a nail-biting penalty kick shootout resulted in a USA win. Mia Hamm and Brandi Chastain became stars, and the game brought huge attention to women’s soccer and athletics.They haven’t won a World Cup since, and they’re ready. USA’s playing style has been characterized as a relentless hustle, never-say-die approach. This team bristles with talent. 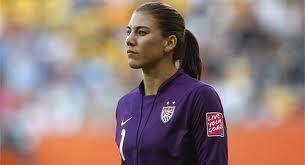 Hope Solo might be the best goalkeeper in the tournament. Star forward Abby Wambach’s late-game goal against Brazil last Sunday was the stuff of legend. Japan has displayed discipline, savvy and skill throughout the tournament. But there’s something more. Shortly before Japan faced two-time defending champion Germnay in the quarterfinals, Coach Norio Sasaki gave showed his players slide-show images of the earthquake and tsunami that struck Japan’s northeastern coast on March 11, killing more than 15,000 people. “They touched us deep in our souls,” midfielder Aya Miyama told reporters. We’ll see how they do on Sunday. Join us. Details here. Great Plays, Affordable Opera, Parties and Puppets. 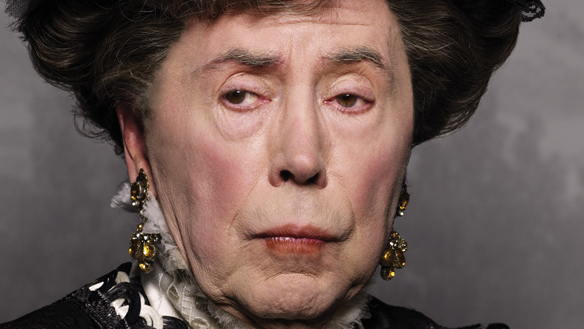 Brian Bedford as Lady Bracknell. Don't get her mad. We’ve talked about THE IMPORTANCE OF BEING EARNEST and THE CHERRY ORCHARD here, so, thrilled as we are to be bringing them to our huge screen from Broadway and London, we won’t go on about it. But: once you’ve seen EARNEST on 6/6, you will want to join us for a TONY AWARDS PARTY on 6/12, if only to root for Brian Bedford as Best Actor for his brilliant turn as Lady Bracknell. So here’s something else exciting. The Metropolitan Opera’s amazing program of satellite transmissions, The Met: Live in HD, is very popular here at the Lark, with most live broadcasts selling out. But we know there’s an audience we’ve yet to reach: people who maybe love theater and musicals but haven’t quite made it over to opera yet, or people on fixed incomes for whom the ticket prices pose a challenge. Is this you? Then you’ll want to know that starting in June we have the Met’s Summer Encore Series, six of the most popular and accessible shows from the past season, for only $15 each. Simple gestures movingly convey a child's curiosity, concern and tenderness. 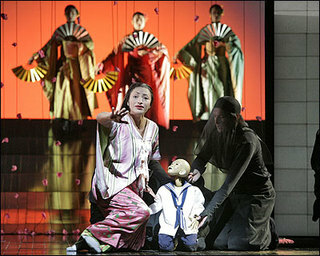 We start with Puccini’s MADAMA BUTTERFLY on Sat, 6/18 at 10am. The insanely beautiful, colorful staging of Anthony Mighella’s production and the music – you’ve heard the heart-piercing aria “Un bel di vedrema,” even if you don’t know it – make this a great introduction if you’re new to opera, or new to opera onscreen. Film-goers know Minghella from THE ENGLISH PATIENT). The production is also graced by the astonishing work of London’s Blind Summit Theatre, which created Cio-Cio San’s puppet child. Read about the production here. Cio-Cio San and her puppet son. Puppeteers are fully visible but go unnoticed. 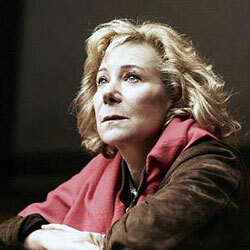 Zoe Wanamaker as Ranyevskaya in the Cherry Orchard from London's National Theatre. At the Lark 6/30 & 7/9. Fast forward a decade or two, maybe you’ve had your heart broken, seen your ideals collide with reality, faced foreclosure – whatever. You’ve come out with a more nuanced, less grandiose idea of your place in the universe. And presto! You get it. It’s a comedy! Chekhov was a doctor, and he treats his characters the way a good doctor treats patients – with an unsparing eye for disorders like pomposity, hypocrisy, and our tendency to waste our lives by sitting around worrying about whether we are wasting our lives. But also with tenderness and a non-judging, all-encompassing humor. Then there’s Oscar Wilde, for a whole different (equally unsparing) take on human foolishness. This stuff is just flat-out hilarious, and no one has to tell you why. We are very happy to bring Broadway to our screen for the first time. I’m going to let the actors speak for themselves here. I’ll only say that Brian Bedford (brilliant classical actor) plays Lady Bracknell, in what is already being called a legendary performance. Excellent and insightful New York Times review here. Now comes the really good stuff. Warning: off-color language. The actors, in full costume and character, performing text from Jersey Shore. Don’t say I never gave you anything. Jersey Shore Gone Wilde part 1 ~ part 2 ~ part 3 ~ part 4 ~ part 5. And, as if all that wasn’t enough, here’s the brilliant Stephen Fry (you may know him as part of the defunct British comedy duo, Fry and Laurie – yes, Dr. House – or from a thousand other things). Click here to read his musings on Wilde and Chekhov, and for recordings of him reading Wilde’s fairy tales and Chekhov’s short stories.